Baking bacon in the oven? You can do that??!! Yes, you can!! I will show you how to bake bacon in the oven with little to no effort. No more splattering grease burns AND each piece comes out perfectly EVERY single time, too! There’s no need to slave away over the stovetop getting splattered with bacon grease anymore. Those days are officially over! Read on and I’ll tell you why. I have to say that I LOVE bacon. Do you think Kevin Bacon loves it, too? Yeah, give me those clogged up those arteries, elevate my cholesterol. I’m going for it. It’s the little things in life, am I right? No. I don’t overindulge, but when it’s offered, I sure as heck ain’t passing the stuff up! Heck, I don’t even buy it that often for my family to eat. I think I purchase it once a month if that. And I do believe that one of the reasons we don’t have it at home more often is because I am forever burning myself with that dang nab grease that splatters ALL over the kitchen. I know, it’s always been part of cooking bacon, but when it’s all over me, that’s where I draw the line. 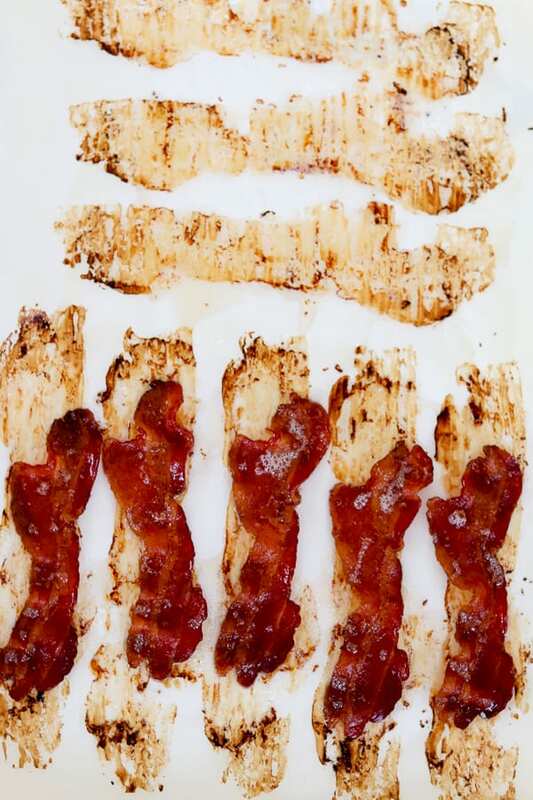 SAVE THIS BAKING BACON – HOW TO BAKE BACON IN THE OVEN TO YOUR FAVORITE PINTEREST BOARD! I don’t think there’s been one time when I haven’t yelled, “OUCH!” or a somewhat more expletive word while tending to the stuff on the top of the stove. Don’t hide it, I know you’ve done it, too! And it just takes so lllloooooooonnnnnnggggggg!!!! I mean, how do you know when it’s done? It’s an eye test for sure. Can you hear me whining? Sorry, but it’s a pain in my patootie. Well, no more. I’ve done gradumatated to baking it in the oven, I have! 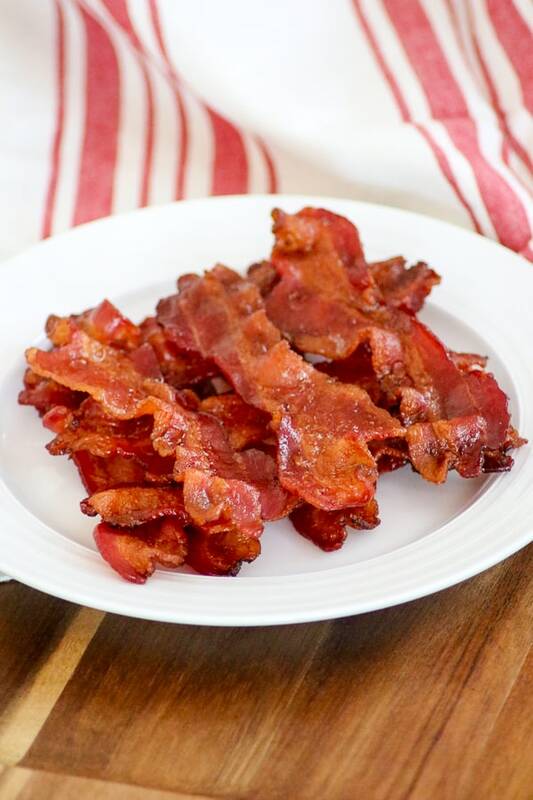 Can I tell you how incredibly easy baking bacon is?!? I am NOT kidding. I feel like I’ve just found a pot of gold or discovered sliced bread for the first time. I’m ECSTATIC! Not only is it easy peasy, but you’re not hovering like a helicopter over the stovetop W-A-I-T-I-N-G for it to cook, you can prepare other dishes for the meal AND there are no choice words escaping from the kitchen during the cooking process. That right there in itself is a reason to give this a go! Oh, but the absolute BEST reason to stick the bacon in the oven, is that it comes out exactly how I like it, crisp and delicious. If you don’t like it crisp, but still want it delicious and just a little underdone as two of my three children like it, just lessen the baking time by a couple minutes. I found this from Trish’s site, Mom On Timeout. 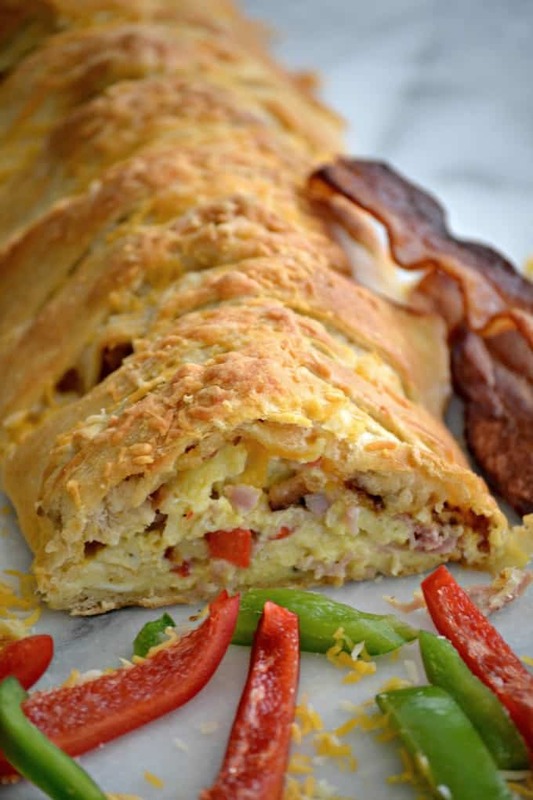 If you don’t want to eat your bacon plain, here are some great recipes that use it. I’m putting this 5-Minute Fully Loaded Ranch Dip on our upcoming Game Day menus for sure! 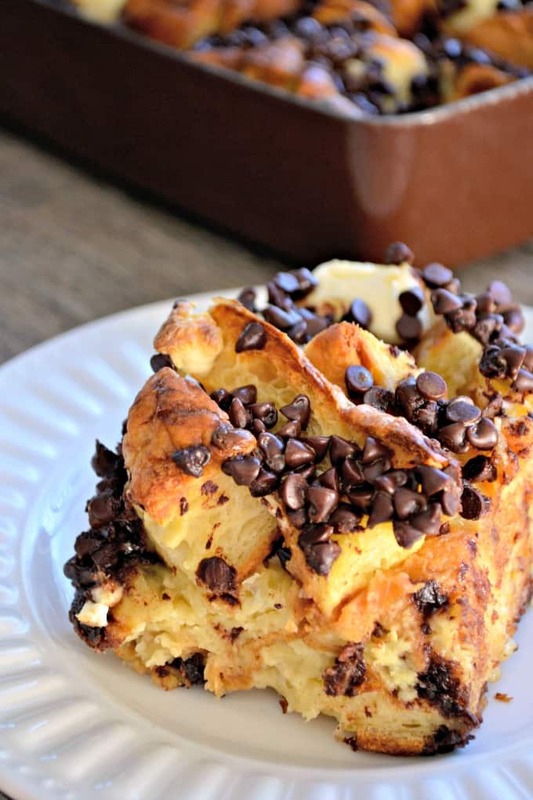 Sandra from Dash of Sanity put some bacon in this and it looks AMAZING! The hungry football crowd will make it disappear quickly, I’m sure! That bacon that you baked up so perfectly in your oven will be delicious in this Apple Bacon Salad from Lisa’s site, Wine & Glue! I love that taste of it in salads, don’t you? And this salad is perfect with Fall right around the corner, too. I thought I died and went to heaven when I saw this Bacon Jam recipe from Meseidy at The Noshery! YOWZA!! I think I’ll be skipping the grape jelly on my toast in the mornings from now on if this is my option! Use a rimmed baking sheet so that there isn’t any run off of grease into your oven. Line the rimmed baking sheet with heavy-duty aluminum foil and then place a piece of parchment down on top of the foil. 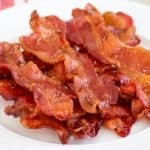 Place your bacon into the pan so that it is in a single layer and the pieces are not overlapping. They will stick together even if they touch, but are harder to split apart if they are on top of each other. As directed in the recipe, I placed the baking sheet into the oven with 8 slices of bacon on it and then turned the oven up to 400° F. I baked it for 10 minutes and then I checked on it as directed. It wasn’t cooked to my liking, so I left it in the oven for 3 more minutes. Still not to my liking, so it cooked for an additional 6 minutes, and I checked it at every 2 minutes. So, a total of 19 minutes and it really was absolutely perfect. No underdone chewy pieces and nothing burnt! Oh, and I couldn’t wait, so I ate the top three pieces. It just smelled SO good! So with the oven already preheated to 400°F from the last batch, I put another baking sheet with the remaining 8 pieces into the oven. I again cooked it for 10 minutes then checked and cooked it for another 3 minutes. Still not to my liking and looked as if it was cooking unevenly, so I left it for another 2 minutes. I DID NOT like the way that the last batch turned out! Parts were done perfectly, but some of it was burnt. Definitely cooked uneven and in a shorter amount of time. Sorry about the blurry pic! How to bake bacon in the oven so that it's just the way you want it! No more burns from that splattered bacon grease and clean up is super easy. Hooray! Prepare a rimmed baking sheet by lining it with a sheet of heavy-duty tinfoil and then place a piece of parchment on top of that. 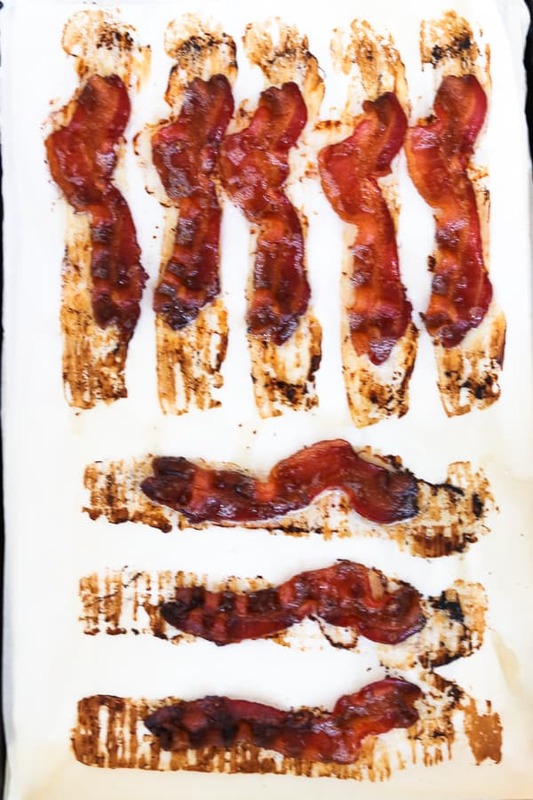 Place the bacon on the prepared baking sheet in a single layer, making sure to not overlap them. Place the baking sheet into the oven and turn oven to 400 degrees F.
Bake for 12 - 17 minutes, being sure to check at the 10-minute mark to see how it's doing. I checked every 3 minutes after that until it was golden and then removed it from the oven. The bacon can go from being perfectly done to burnt in a very short time, so it's important to keep your eye on it after that 10-minute mark to make sure it'd done to your desired doneness. 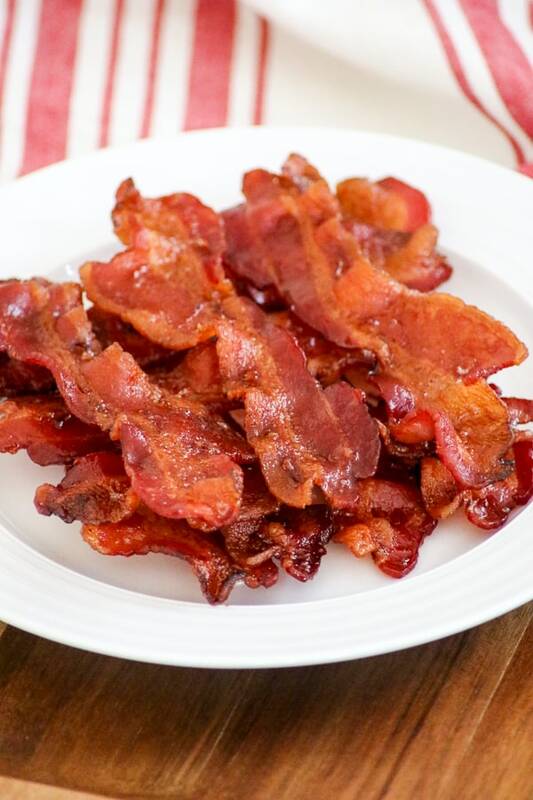 Remove bacon from the oven and place on a plate lined with paper towels before serving. 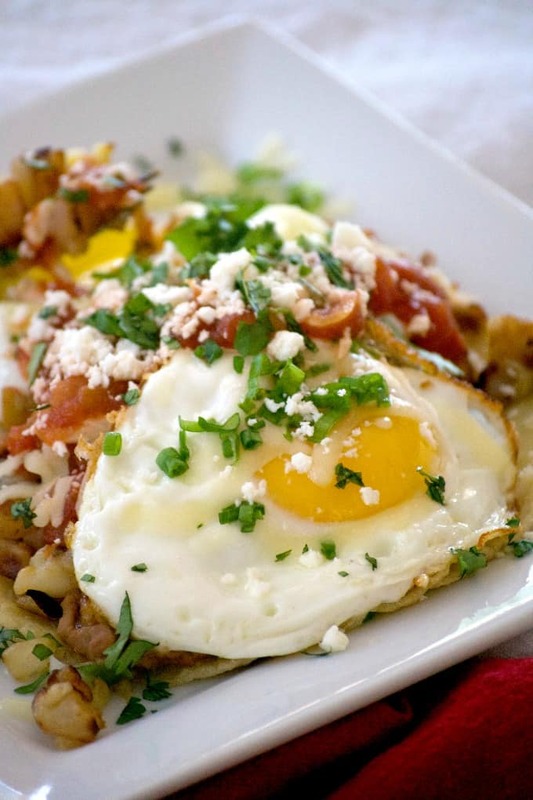 Here are some delicious breakfast ideas that you can serve right along with your bacon! Just the way you want it. No splatters. Easy cleanup. And a happier you. Your question of how to cook bacon in the oven has been answered. I discovered this “trick” a few years ago and I will never go back to cooking bacon in a skillet. What I do is I use a baking sheet with a lip, line it with tin foil. Then place cooling racks used for cakes/cookies inside, grease drips down and super yummy crispy bacon is the result. That’s what I do, too! Works like a charm. I’ll never cook bacon on the stove top again! I agree, Cathy! It has saved me so many times from getting splattered with that hot baking grease! Best way to cook bacon EVER! 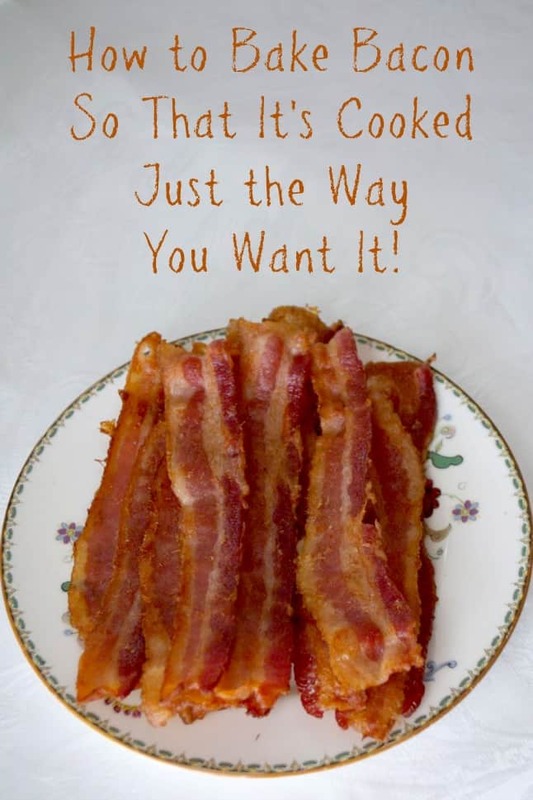 It changed my life =o) Seriously tho, this truly is the easiest way to cook bacon. 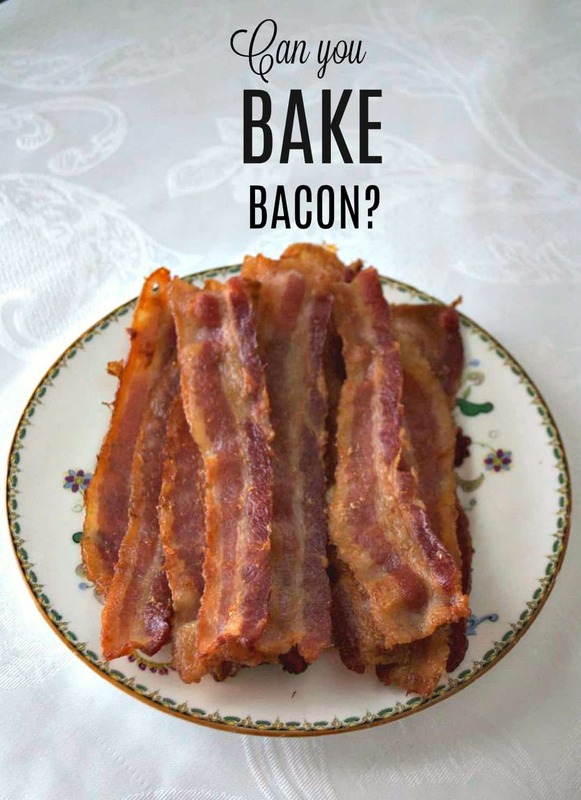 I use my wire rack for cooling cookies and put in it my large pan and then set the bacon on the wire rack and you don’t have to worry about the bacon sitting in the grease. Enjoy!! 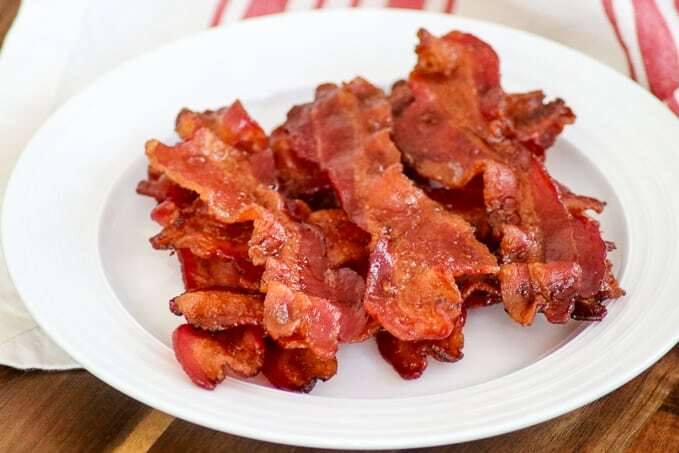 If you put a cooling rack in the pan and put the bacon on that it works just as well, but you don’t have to drain as much fat off the bacon. Love my bacon cooked this way! You actually don’t have to line your pan with tinfoil either. I use a Pampered Chef large bar pan and no paper or foil and it works nicely. No sticking. I doubt it would stick to a normal pan as there’s a lot of grease in the pan. Take it out after 15 to 20 min and turn it over, then let it cook until it’s as done as you like. It doesn’t splatter your oven either. i found this trick a few yrs ago but I put it on a rack, in the pan. So easy, I’ll never go back to stove top! It is awesome! Thanks, Kim! I normally cook several pounds of bacon at one time. Using a paper plate I place a paper towel on the plate then a layer of cooked bacon. Another paper towel then a layer of bacon. Repeat. Once cooled the plate with bacon goes into a Zip Lock gallon freezer bag and into the freezer. This way I can use a few slices at a time. I can’t tell it has been frozen. That’s a great idea, John! I freeze my bacon after I cook a lot of it. It definitely makes it easier to use it when called for in a recipe. Thanks for the comment! I use the broiler pan. Spay it down with Pam for easy cleanup. All that grease drains to bottom pan. Who wants the bacon sitting in all that grease!? Yummy results. Good idea, Neen. It’s also easy to put a rack in the rimmed baking sheet as many people have suggested and cook it that way. Everyone has a preferred way of doing it which is great! I like using a piece of parchment paper in the pan. It never sticks to it. I have tried no paper and even with all the grease it stuck. I did bacon one time in my oven and it splattered the grease all over and then the next time I used my oven it got all smokey does that always happen when you do your bacon ? I have not had a problem with the bacon splattering in my oven, so I much prefer to prepare the bacon this way. I think Your having issues because your preheating your oven? At 400 degrees bacon starts to spatter and burn at about 6 or 7 minutes because heat is to high for thin bacon , where when starting oven cold with gradual heating for short period the bacon is always perfect around 9 to 11 minutes (in my oven). Check it often. You don’t preheat the oven? This is dangerous as the food will be in the temperature “danger zone” until the oven is properly warmed. Definitely follow food safety guidelines and preheat the oven! Denice, neither I nor anyone who has made this recipe has encountered any issues that I’m aware of. I cannot speak for other peoples’ ovens, but mine does not take an hour to warm up to the desired recipe temperature. I do not believe it’s as serious an issue as you make it out to be. If someone has a concern with it, then they can choose to cook their bacon a different way or preheat the oven beforehand. Since aluminum has recently been linked definitively to Alzheimer’s (https://www.ncbi.nlm.nih.gov/pubmed/21157018), I go for parchment paper lining the pan instead. Cleanup is easy, too – once the bacon has been removed and the grease has cooled somewhat, I put the pan into the frig for a minute so the grease will harden. Then I roll up the grease-filled paper and throw it away. Usually the pan is still clean underneath! I use the parchment now in addition to the aluminum foil as well, Patricia. Thanks for letting me know that as I hadn’t heard! It definitely makes cleaning up easier as well! You don’t have to preheat the oven first?? No, Cathy. I thought that was odd as well, but I think it works better actually. The bacon slowly cooks as the oven heats up. I won’t make my bacon any other way now! Hope you like it! Though that is dangerous according to food safety guidelines. The bacon will be in the “danger zone.” It’s clearly stated when taking the “Food Handler” course. Yeah no preheating is BS. It’ll smoke up the entire house without preheating. I have never had an issue with my house smoking when I’ve followed the directions for this recipe. Ive been doing this a long time. Wife was reluctant to try it. For 12 years mind you! I sent her to the store one day and had bacon cooked when she was home! After we ate and btw let her assume it was skillet cooked! She loved it. Then dropped the hammer!!! The look was priceless! We now bake it everytime! Keep up the posts and ideas please. Love them! Ahhh, Vincent, your comment so made me smile! I love how you surprised your wife and then told her after she was eating it! SO awesome! The only time I ever use the skillet is when I only have to cook up a few pieces and don’t have any already cooked and in the freezer. And inevitable while I’m doing it, I get burned and kick myself for not baking up a whole batch and freezing it beforehand. Thanks so much for your comment and kind words! I’ll definitely continue to keep you informed! Hugs! I’m fond of my griddle in general, but this method works. I only used foil and pry 11 pieces some broken in half on a 19″ alumnium deep dish pizza pan. Took about 21 minutes for the thick cut bacon. In oven as it’s warming up? For the 10 min? Yes, I start the timer as soon as I put the bacon into the oven and turn it on. My oven usually takes 12-17 minutes to get the bacon to where we like it. After about the 10 minute mark, check on it every two minutes or so because it can go from perfect to burnt very quickly. You also may have to rotate the pan depending on your oven. Hope you like it! Awesome work. You have shared an outstanding recipe. Thanks for such good work.